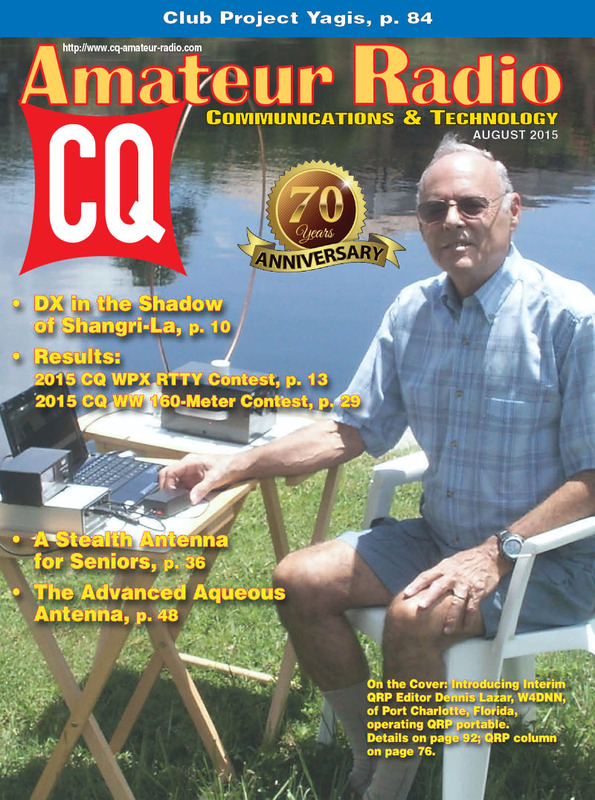 The August issue of CQ is a contester's goldmine, with results of both the 2015 WPX RTTY Contest and the 2015 CQWW 160-Meter Contest, plus the rules for the 2015 CQ World Wide DX Contest, a look behind the scenes at the "bonus station" for the 2014 Pennsylvania QSO Party and a discussion of the honor system in submitting contest logs. If you're not into contesting, don't worry, we've got plenty more, starting with a trifecta of antenna articles: one on a stealth antenna for a condo, another on building an antenna that uses salt water as the radiating element instead of metal (! ), and our Antennas column on a UHF Yagi that's perfect for a club antenna-building project. We also examine a bit of radio history with W4YO's "DX in the Shadow of Shangri-La: Ham Radio in Sikkim and Tibet," and the conclusion of WB4WYJ's review of life in the radio shop at Disney World. 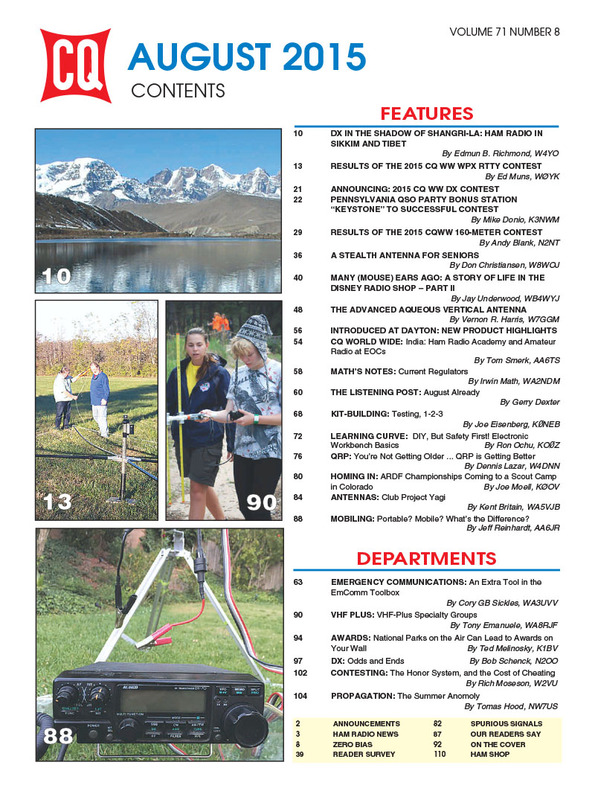 The August issue also includes some highlights of new products introduced this year at Dayton (see our complete online listing here), as well as electronics workbench basics, test equipment you can build, and the "summer anomaly" in HF propagation. Note: Two of this month's articles are follow-ups to articles that appeared in our digital-only CQ Plus supplement. For the benefit of print edition readers, both of those original articles have been posted here on our website. See below for links. Finally, we're continuing to celebrate CQ's 70th anniversary by extending the deadline until August 15 for your nominations for "The CQ 70," a compilation of the most influential people in our hobby today. 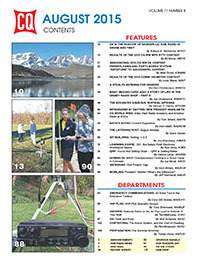 Details are in the June and July issues and here on our website (see links below). That's a brief look at what's coming up in the August issue of CQ magazine. For information on becoming a CQ subscriber - to either our print or digital edition - click here! 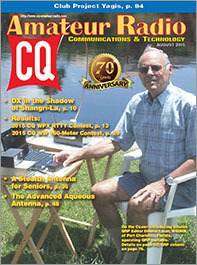 On the Cover: Introducing Interim QRP Editor Dennis Lazar, W4DNN, of Port Charlotte, Florida, operating QRP portable.